A toy that really grows with your child. When your young one is a crawler, the Push N Pull Elephant's large handle is sized for little hands to push the elephant across the floor. As your child grows into a walker, a string can be attached to the front of the elephant through the hole, and it becomes a pull toy. 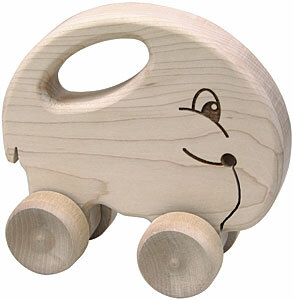 The Push N Pull Elephant measures approximately 6" long by 6" high by 2-3/4" wide. Crafted from locally sourced, responsibly harvested maple with hardwood components, laser detailing on both sides, and no finish...just wood and glue.